The RING team wishes you a merry holiday season, and a happy and peaceful year 2018 ! 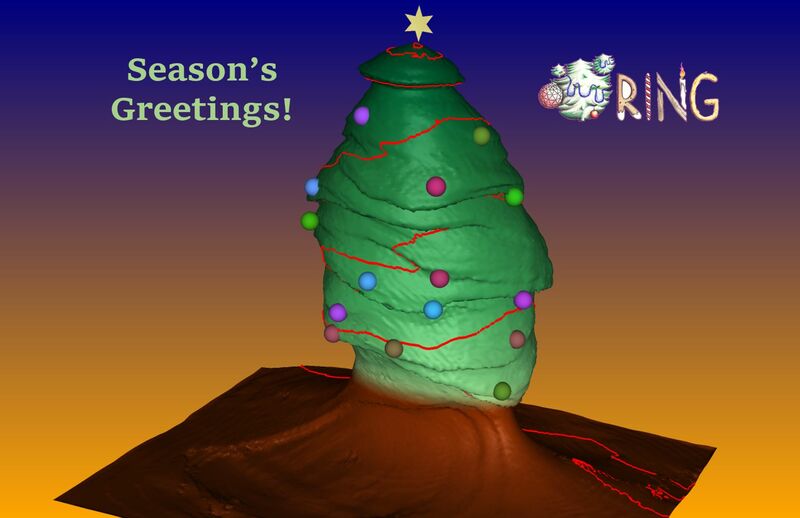 This RING Christmas Tree was generated with SKUA-GOCAD using the stochastic method of Nicolas Clausolles, see Nicolas's IAMG 2018 award on salt modeling. The RING Team is pleased to present you the Newsletter for April 2018. Discover our exclusive new display ! Congratulations to Dr. Antoine Mazuyer who sucessfully defended his PhD on the 19th of April 2018! The video of the defense in now available (in French) on YouTube. Congratulations to Dr. Marion Parquer who sucessfully defended his PhD on the 5th of April 2018! The video of the defense in now available (in French) on YouTube. Yanis, our young intern, modeled the Solar System!